by Hilton Hater at April 3, 2017 10:46 am . Christina El Moussa and Tarek El Moussa no longer share a bed. But they clearly still share an interest in one another. The Flip or Flop co-hosts separated last May and filed for divorce in December. They continue to film episodes of their home flipping reality series, however, and continue to co-parent a one-year old son and a six-year old daughter. They also continue to say nice things about each other to the press, denying rumors of infidelity on both sides and repeating over and over that the well-being of their children is their top priority. But read between the lines, people. Actually: check out their social media photos. Then, you'll see some serious tension has formed between Tarek and Christina. It all started a couple weeks ago, back when Christina flaunted her bikini body for the entire world to drool over. Was she simply taking fans behind the scenes of a photo shoot with her daughter? Having some innocent fun? Or was she sending a message to Tarek via some kind of revenge body he'll never get to touch again? Tarek responded to the picture above and others like it by releasing his own set of sultry photographs. Taking the Internet by storm, El Moussa went ahead and unveiled a set of rippling muscles and a tight physique that we had no idea had been hiding under his shirt for so long. The home renovator denied, of course, that he showed so much skin in response to his estranged wife having recently done so herself. "My doctor said "You would probably never be able to lift weights again"... that motivated me to prove him wrong and get into the best shape of my life!!! "Remember....it's not the size of the dog in the fight, it's the size of the fight in the dog." We weren't the only website speculating on whether this was a battle of the hot bodies between Tarek and Christina. And now we appear to have a showdown of hairstyles. Over the weekend, Tarek debuted a fresh haircut, even joking at the time that so many changes clearly meant he was going through a midlife crises. "OH NO!!! New #clothing.. New #hairstyle.... #No more sandals!! Half #naked pics!!! Is this a mid life crisis??" Tarek wrote along with the following image. ... until Christina then went ahead and changed her hairstyle as well! The 33-year-old traded in her straight hair for a sassy, curly hairstyle at the 2017 Real Estate Wealth Expo in Chicago Sunday. The HGTV star herself didn't share the new 'do on Instagram, but she did reference the salon that came up with it for her. "Had so much fun presenting at the real estate expo ... now back to Cali... [peace] out Chicago," Christina wrote on her account. "Thank you so much for the beautiful hair and makeup @nikimoonsalon." So great seeing @christinaelmoussa again! She makes our job easy since she is such a beautiful canvas to work on. Hair by Niki, makeup by Anna. #nikimoonsalon #christinaelmoussa #fliporflop #hgtv #modernsalon #btcpics #Chicago. Tarek and Christina's future on HGTV remains up in the air. Most signs point to the network giving the axe to Flip or Flop after Season 7, which likely explains why Christina has been making so many media rounds of late. She's angling for a spinoff and/or simply trying to push her own brand. But let's hold off on predicting her professional future for a moment. Let's focus on her personal future instead. Should she stick with this new hairdo? Or return to her old hairdo? WHICH LOOK ON CHRISTINA EL MOUSSA DO YOU LIKE BEST? 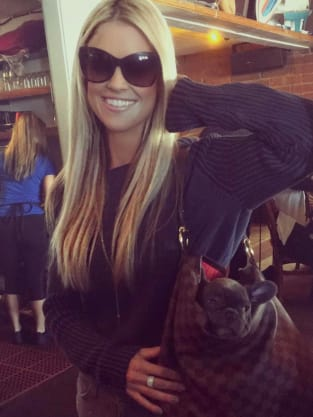 Did Christina El Moussa Just Take Another Shot at Tarek?